"A gorgeously written historical fiction novel set after the Cuban Revolution..."
In addition to Nick, Beatriz catches the eye of CIA operative, Mr. Dwyer, who wants Beatriz for very different reasons. Unbeknownst to most of the US government, the CIA is trying to infiltrate Fidel's inner circle, and knowing Fidel's affection for pretty women, Dwyer thinks Beatriz is perfect for the job. Her tumultuous-yet-loyal connections to Cuba make her the perfect double agent, and Beatriz wants nothing more than to kill the man responsible for her brother's murder. As Beatriz gets more involved with the CIA, her tenuous relationship with Nick is put to the test. Can they beat insurmountable odds to be together? 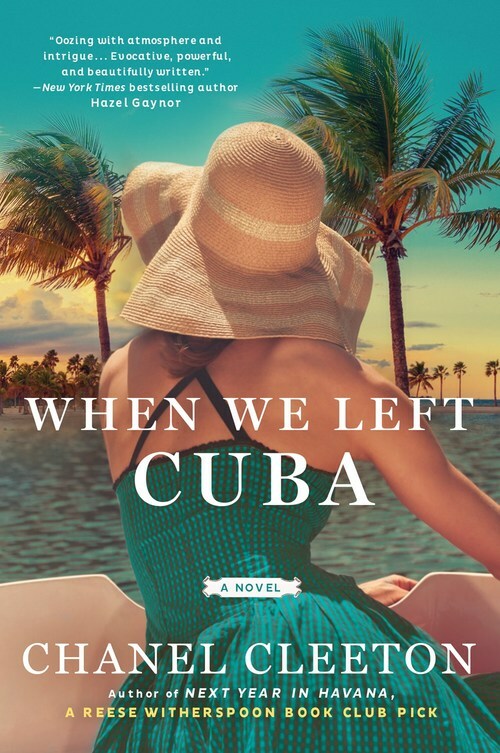 WHEN WE LEFT CUBA is a gorgeously written historical fiction novel by Chanel Cleeton, which tells the story of Beatriz Perez, the sister of Elisa Perez, the main character of NEXT YEAR IN HAVANA, which I loved. Beatriz is a formidable, beautiful, and seductive character - she practically jumps off the pages of this book. Her story is one of sacrifice, passion, and self-discovery. She gets involved in so many things considered risky - student groups during the revolution in Cuba, then with an engaged senator in America, as well as the CIA. There's quite a bit of this novel, especially in the latter half, where Beatriz simply listens to men explains things to her, be it her lover Nick, her CIA contact Dwyer, her brother's best friend Eduardo, or even Fidel Castro. For a character set up to be so independent and confident, she endures quite a bit of mansplaining and I was waiting for a moment when she'd step in and say something back. Beatriz's internal dialogue was dynamic and smart, and I wanted her to voice her opinion more. The chemistry between Beatriz and Nick is palpable and there's no denying they truly care for one another; I hoped they could find a way to be together! Beatriz's time spent as a double agent didn't grab me as much as I expected it to, but I liked the drama and reflection it leads to for her. Still, I found WHEN WE LEFT CUBA to be a captivating and engaging novel, one that shed light on important historical events: the Bay of Pigs, the Cold War, and Kennedy's assassination from the perspective of a woman trying to decide where her loyalties lie - with the home country that betrayed her, the new country that took her in, or to the man who steals her heart?